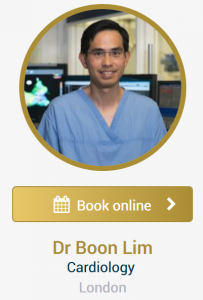 Dr Boon Lim was again awarded Top Doctor of the year in 2018 for cardiology, making it the second successive year that Dr Lim has been awarded this accolade voted by physician peers across the UK. Dr Boon Lim continues to provide world-class patient-centered care in and is considered one of the best cardiologists in London UK. He is increasingly recognized by peers and patients alike as an expert in Syncope and Electrophysiology, treating conditions such as Atrial Fibrillation (AF), Supraventricular Tachycardia (SVT), and Atrial Flutter. He has a consultation style and manner which is well-liked by patients.